July | 2014 | Mom of Tornado - The realization of the last 30 something yrs. The wonders of the Circus. 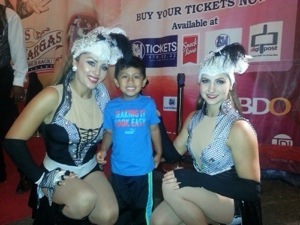 We had the pleasure of attending for the first time Circus Vargas: Magikaria Extreme. Hands down it was such a great show. 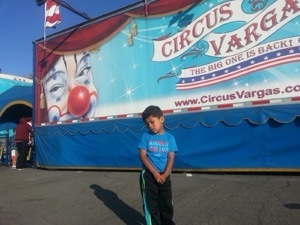 Just seeing my sons face as the magician did his tricks, or the acrobatic artists did there aerial show was priceless. I was even entranced with the trick and performances myself. My favorite act was the aerial rope dancers. Alex the trickster clown was also hilarious. My son laughed out loud so many times through out the entire show. We are still talking about the magician and his extremely fast changing assistant and the balancing tricks of the announcer. My son had the pleasure of volunteering his shoe for one of his balancing tricks. The meaning of heading to the circus and sitting under the big top was literally what we did. The tents are erected and you walk in and it’s a right there all in front of you, the center stage where all the magic happens. All the seats are good seats. The Preshow event was also great for the kids. This is what a circus should look like. What I imagined when I was a child and was so pleased I could give that experience to my son. This was not a huge arena where there are 2 or 3 acts going on at the same time that you can barely focus on one thing, or your seats are so far away from the action that you don’t see everything. We did that last year and the excitement my son showed after watching this show was completely different. He could not stop talking about all his favorite acts to the point that he even knew what they were wearing. The fact that he will always remember this event to the smallest details. To me that’s what a show should be like for a child. 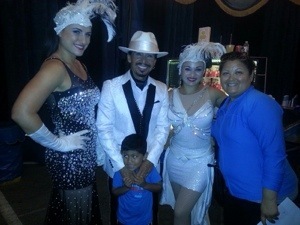 After the show we were able to obtain signatures from all the performers and get pictures taken as well. We had a wonderful first time experience and we will defiantly come back the next time they are in town. Have you attended a circus show lately? ** this is not a sponsored posting and all tickets for the event were purchased by myself. The opinions in this post are strictly my own and in no way do I represent the event. 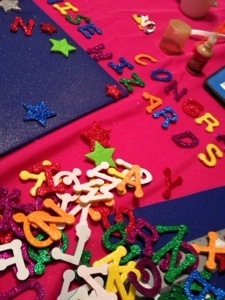 Preschool graduation Cap- How to make your own. So this year my little munchkin is graduating preschool. And our school asked the parents to please make their child a graduation cap. They asked that we be creative but stick with the colors they had chosen. So obviously where would I go to find a great how-to… PINTEREST. I found some great pins but stuck to one pin that I used as my template to make my little ones cap. I purchased poster board and a foam poster board at the Dollar Tree. Got a few extras just in case. So that was easy . Picked up some sticker letters , stars and some glitter spray on paint at Wal-Mart. – Using a ruler I cut out two squares . I cut a 12 x 12 size squares. – To give the cap portion a bit more stability I taped the colored poster board into the foam board. – I sprayed both pieces with the glitter paint. 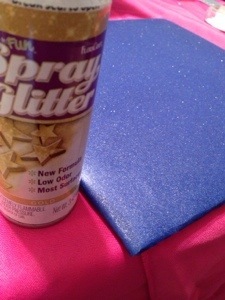 I choose a nice gold glitter that shows great on the dark blue paper. Easily dried within 5 min. – Decorate each piece to your liking. You can use paint, stickers, markers. Use your imagination. – Then glue both pieces together. I choose to cement glue it instead of taping it because I know he will drop it or it will fall on the floor a few times. 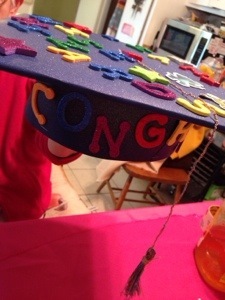 The tassel was super easy to make. – On a three inch piece of paper roll the thread around a few time. You can do it as many times as you want. 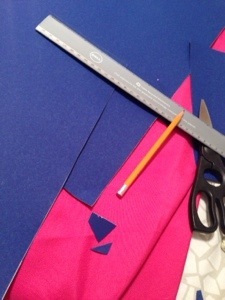 Tie up one and cut the loops to make the tassel portion. 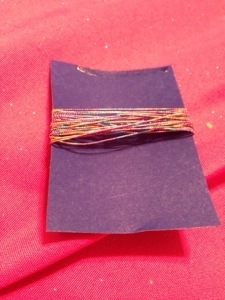 Attach a string to your specific length from the cap portion and allow it to just hang. Let me know if you tried doing this at home. I’d love to hear how it turned out. Have comments let me know. Don’t forget to follow me on twitter and facebook. Once I saw the advertisement for this product I decided I wanted to try it. 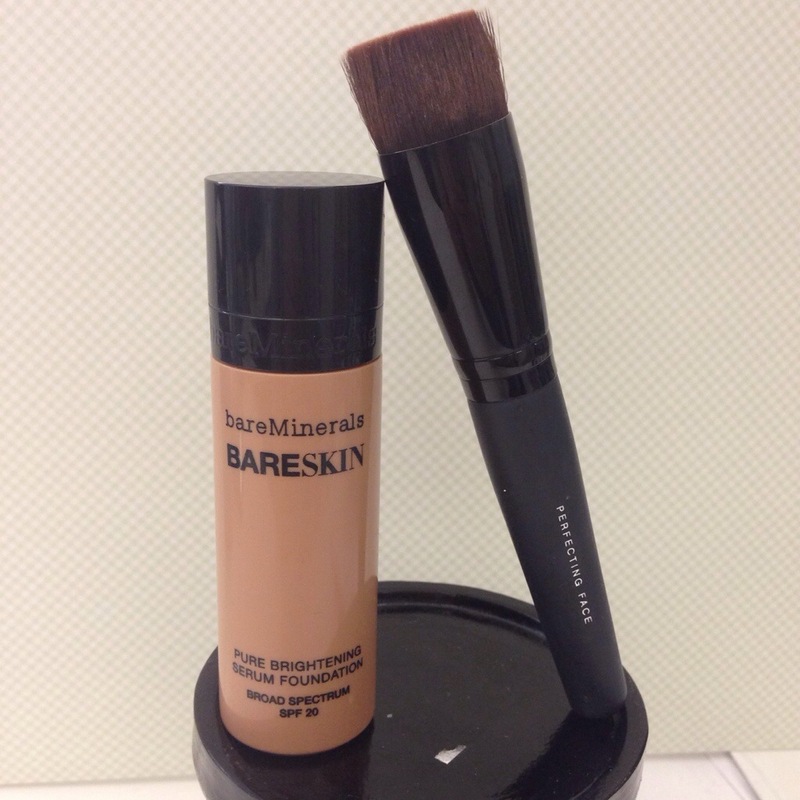 Since I’ve used the bareMineral powder foundations in the past I was eager to try this foundation. The ease in use of their products for me has been there winning point. 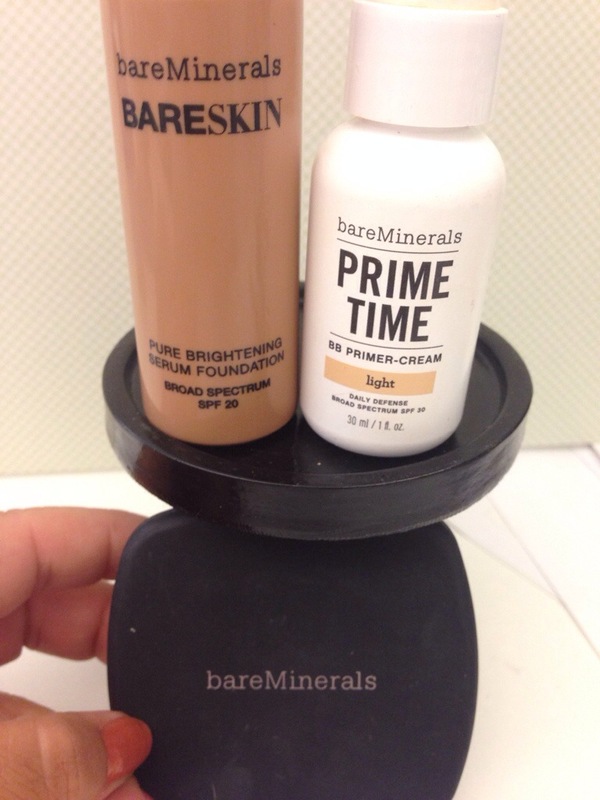 I could have gone to a specialty store or QVC to just buy the product but I had a bareMineral boutique close to my home and I wanted to make sure I got a perfect match for my skin tone. Especially since my winter skin is completely different then my summer skin. I love going into a store and knowing exactly what I’m looking for; and boy was I happy that I did. Their range of color selections is vast and I know I would have picked something way to light for my current skin tone. She tested a few out and easily found my correct shade. The product can be used alone or you could apply a primer first. Since I tend to get super oily towards the end of the day this is the best option for me. This has been one of my pet peeves with my current BB cream routine. I literally feel like an oily mess towards the end of my work day. After she primed my face she showed me just how far one drop can go. Per the instructions she says two drops is pretty much all I need to obtain a nice even coverage on my face. If I wanted to build on it I can do so as well. She applied one drop then proceeded to apply the foundation to only half my face. Using the second drop she applied it to the other half of my face. I’ve seen some reviewers who have used up to 6 drops all over their face so when she demonstrated the even coverage she obtained with just two drops I was relieved. If you know me you know I love BB creams because of the simplicity, sheer coverage and even skin tone I obtain from the product. Most of the times I’m the only one who knows that I have some semblance of make up on. This product pretty much delivered just that. A nice even coverage so light that I barely feel it on my skin. First impression- I’m surprised to see how watery the product is. As she applied it I did not feel any wetness or sliminess. All I felt was the soft brush against my skin and she buffed the product onto my skin. I instantly noticed a difference. 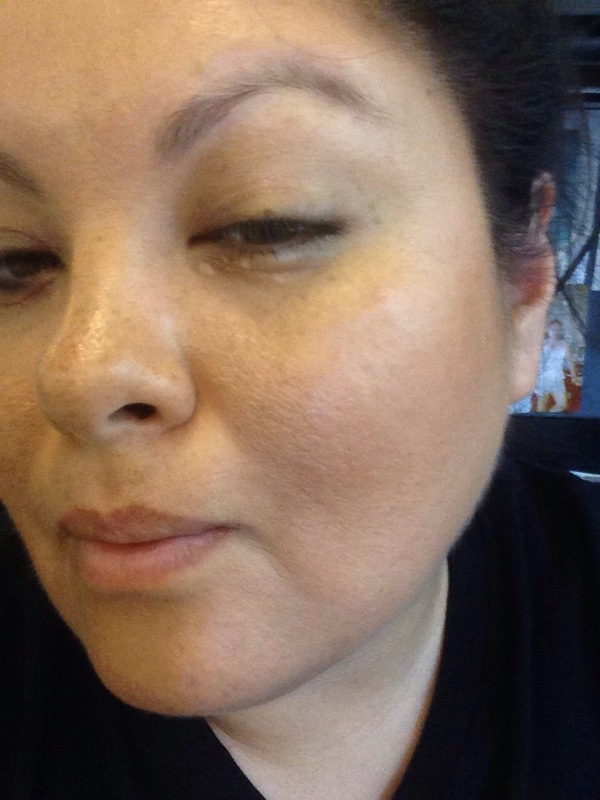 I noticed the redness on my cheeks had diminished and my skin looked even. As I walked out of the store with my new purchase I took note to see how my skin felt. I did not feel that I had make up on at all. Sometimes even with a BB cream my skin can feel smothered. Not with this product. This was applied at around 1pm. Note I was in a mall with my child and the weather was beyond beautiful so we did spend some time playing outside, running around being silly. At around 6pm when we sat down to dinner I noticed I was s bit oily in my regular area (chin and cheeks) but not enough to prompt me to go wash my skin. Usually I would have been blotting my skin because of this. So I was impressed. At 9pm when I was going to remove my makeup I noticed the product was still on still had that even skin tone look to it. Not super oily either. First impression at applying it myself: After I washed my skin and primed it I took the brush and applied a good size drop then did half my face. I dotted the brush on my cheek and forehead then started to make a circular buffing motion all over that side making sure I reach the temples, my nose, my chin, my cupid bow and under my chin. Doing the same thing the other side with my second good size drop. I decided to try it this way first so I can see what it looks like following the direction the young lady at the store gave me. Not even 5 minutes later I was done. My skin had a nice even tone but you could still see my freckles. If I wanted to do a fuller coverage I would do the process over again. It’s something I will have to try if I go out at night. But this is perfect for an everyday day look. I added some blush and mascara and I was ready to go. Let me know if you have tried this product. What did you think? Would you repurchase? All product featured were purchased with my own money.